Today’s horse barns range from simple pole barn type sheds to highly elaborate “horse mansions.” MDBarnmaster’s unique construction method has revolutionized the horse housing industry over the past 30 plus years. We can build a barn to meet all of your needs. MDBarnmaster’s laminated wall system provides the cornerstone of MDBarnmaster’s basic building design. 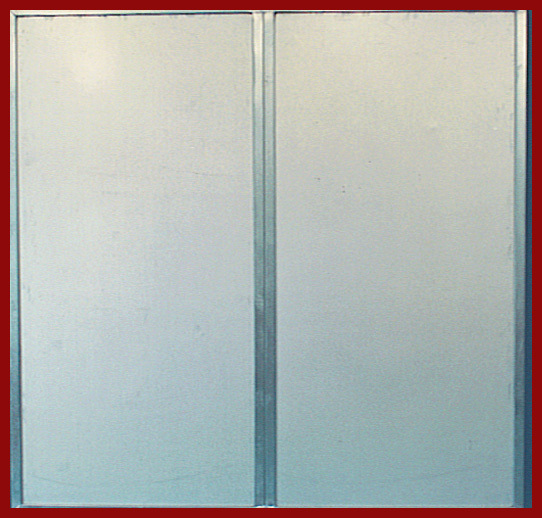 Our basic ¾ inch wall consists of high quality ¾ inch exterior plywood sandwiched between two sheets of 26 gauge embossed, baked enamel coated steel. The steel sheets are laminated using high pressure compression. MDBarnmaster then seals the plywood edges to prevent water from “wicking” up the plywood. Our optional two inch wall provides insulation for cold weather climates. 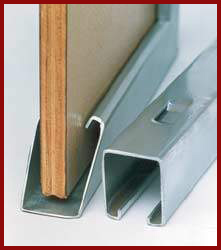 MDBarnmaster forms its wall channel (framing) from rolled, galvanized 14 gauge steel. The bottom rail of the wall channel is hot dipped galvanized after it is rolled (using the already galvanized material) for superior rust prevention. The wall panel is inserted into the wall channel frame, creating a tough, attractive finished wall section. 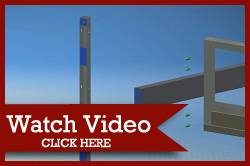 The wall sections are then welded together to create walls in the dimensions required for each specific barn plan. The wall sections are modified to add doors, windows, grills and other features for each unique barn. One-half inch nuts are embedded on the side edges of the completed walls. When assembling the barns, the walls are tilted up and a two inch connector column is positioned vertically along the wall edge. Pre-drilled holes in the connector column line up with the welded nuts on the wall panel and the walls attach to the column with three ½ inch bolts. Ease of Installation. Because almost every component of an MDBarnmaster building bolts together, MDBarnmaster barns can be assembled as “do it yourself” projects or installed professionally at a fraction of the cost of other barns. Zero Fire Spread. Because steel encases the only wood (fuel) used in constructing an MDBarnmaster barn, oxygen cannot reach the fuel. Fire needs both fuel and oxygen. Any fire in your MDBarnmaster barn will burn out without spreading across your barn like it will in a wood structure. Unfortunately, we have all heard of the horrible barn fire disasters that occur in the horse industry. You don’t need to risk having that happen to you and your horses. Chew Proof. 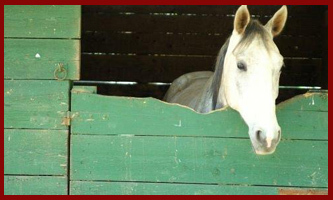 MDBarnmaster barns have no wood accessible for your horses to chew. We have all seen wood barns and stalls after they’ve had horses in them for a while. What may start out as an attractive wood structure soon ends up as a partially eaten maintenance nightmare. Wood chewing also presents health issues and many believe leads to cribbing, a serious stall vice. Kick-Through Proof. MDBarnmaster’s unique wall design prevents horses from kicking through your barn walls, which protects both your barn investment and your horses. Plywood surrounded by steel can withstand any horse kick and we guaranty it for as long as you own your barn. Your horses may dent the walls, but they will not kick through. Imagine the terrible leg and foot injuries this prevents. MDBarnmaster walls also flex slightly when kicked. The entire wall absorbs the shock from the kick, not your horses’ legs. Healthy Horses. Wood barns are almost impossible to keep clean and disinfected. Unless they are finished on the interiors with smooth surfaces, the exposed wood trusses, rough sawn treated posts and other exposed lumber attract birds, pests and dust. Wood harbors harmful bacteria and disease that could endanger your horses’ health. Many surfaces are inaccessible. Even accessible surfaces absorb dirt and bacteria. MDBarnmaster barns are finished with smooth surfaces straight from the factory. Our walls do not harbor harmful bacteria and they can be cleaned with a disinfectant of your choice keeping your horses free from debilitating germs, bacteria, and disease. No Cuts/Scrapes. MDBarnmaster’s standard proprietary wall channel has no slivers or sharp edges to pull manes and tails or scrape your horses’ hide. Finished Surfaces, Comfortable and Easy to Clean. MDBarnmaster walls are delivered to you from the factory completely finished and ready to use. The walls are smooth without the need for added framing, sheeting and painting. To get the same clean bright space from pole barns, steel barns or other structures, you would need to spend much more in labor and materials than you need to spend on an MDBarnmaster building. Not only are MDBarnmaster barns cleaner and brighter when they are new, it is very easy to keep them that way. You can pressure wash your barn once a year and keep it like new. There are no unreachable spaces to house and conceal spiders and other vermin in your MDBarnmaster building. You are buying your barn or shop for your comfort and pleasure - MDBarnmaster’s clean, bright finishes provide that. Low Maintenance. Consider what your barn will look like in years or even decades to come. When you consider maintenance, aging appearance, and resale, MDBarnmaster is the best value in the barn industry. MDBarnmaster barns free up your time to do what you love most – ride your horses. Mobility and Future Additions. MDBarnmaster’s modular design allows you to move your barn from one property to the next easily and at low cost. MDBarnmaster’s modular design also allows you to add to your barn as your horse housing needs grow. MDBarnmaster offers a low price and provides the best value in horse housing, shops and other buildings. MDBarnmaster provides the best safety (zero fire spread, chew proof, kick proof), convenience (easy to clean and disinfect, damage resistant) and beauty and comfort (clean and bright finished surfaces). Our barns are located at the most prestigious equestrian centers in the world, including the West Palm Beach International Equestrian Center in Wellington, Florida and most of the Horses In the Sun (HITS) facilities around the country. HITS recently installed new MDBarnmaster stables at its Culpeper, Virginia location. The owner of the West Palm Beach facility installed our barns at a new state of the art facility in Tryon, North Carolina with nearly 500 stalls. Indiana Downs Race Track just completed four new barns in November 2013 with a total of 400 stalls. Sky Ute Indian Tribe Fairgrounds in Ignacio, Colorado just completed a barn with 80 stalls. Some of the most famous horsemen in the world have also purchased MDBarnmaster barns for their horses, including Pat and Linda Parelli, Al Dunning, Bob Avila, Chris Cox and John Lyons. We appreciate your interest and would love to help you join the long list of satisfied customers.